If you want to have an idea of what the famed “Rebel Yell” of the Confederates sounded like, check out this video put out by the Smithsonian. It was taken from film footage of Confederate veterans in the 1930s who stood up to the microphone and did their best to give their version of the famed yell 65+ years after the war ended. By MARK DUELL UK Daily Mail The antique dealer jokes that his photo is proof Nicholas Cage is more than just an a-list actor – he’s also a vampire who lived during the American Civil War. An eBay seller claims to have a 4” by 2.5” carte de visite photo from around 1870 of a man who looks exactly like the 47-year-old star of Con Air, Ghost Rider and The Rock. The seller, who has put the starting price at $1million, says the photo is 100 per cent genuine and was taken of a man who lived in Bristol, Tennessee, around the time of the Civil War. The man who put the photo on eBay is Jack Mörd, of Seattle, Washington, whose Facebook page says he is originally from Los Angeles, California, and owns ‘The Thanatos Archive’. ‘My theory is that he allows himself to age to a certain point, maybe 70, 80 or so, then the actor “Nicolas Cage” will “die”,’ Mr Mörd joked. The picture was found in the back of an album that contained many unusual death portraits from the Civil War era – but the Nicholas Cage lookalike was not identified by name, Mr Mörd said. He has a 100 per cent positive feedback rating on eBay and his profile says he is interested in collecting and selling Victorian Era post-mortem photography, as well as other vintage pictures. 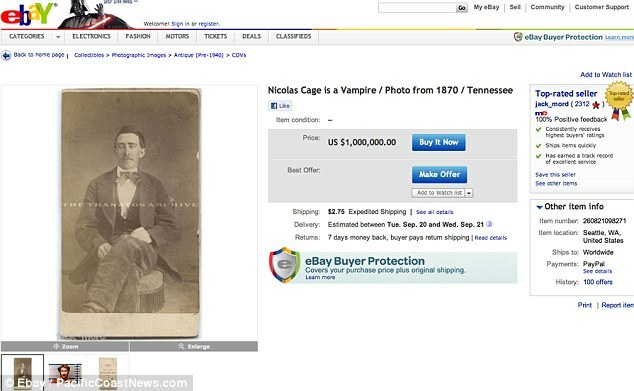 The eBay product description for ‘Nicolas Cage is a Vampire / Photo from 1870 / Tennessee’ says: ‘Original c.1870 carte de visit showing a man who looks exactly like Nick Cage. ‘This is not a trick photo of any kind and has not been manipulated in Photoshop or any other graphics program. It is believed the photo was taken by a confederate Civil War prisoner of war photographer called Professor G.B. Smith. Mr Mörd joked that Nicholas Cage could be a walking undead man who reinvents himself once every 75 years – and might be looking at going into politics or talk show hosting next. 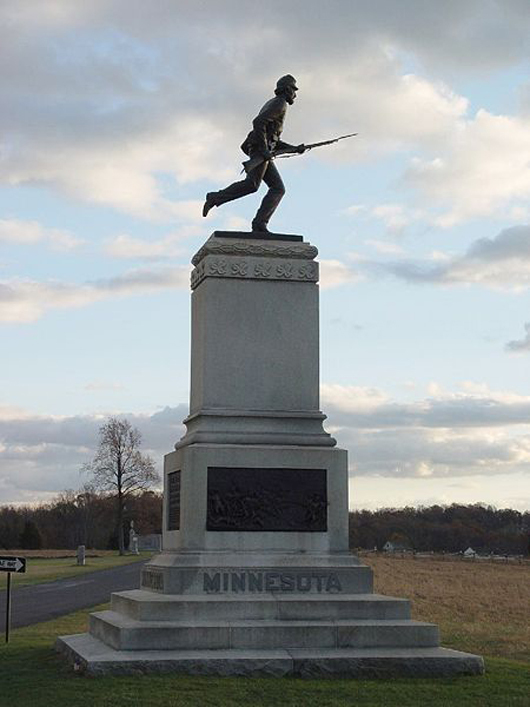 Monument to the 1st Minnesota Infantry at Gettysburg National Battlefield, Gettysburg, Pennsylvania. Image licensed under the Creative Commons Attribution-Share Alike 2.5 Generic and 1.0 Generic license. As Civil War sesquicentennial commemorations shift into high gear, the Library of Congress has kicked off its remembrance with “The Last Full Measure: Civil War Photographs from the Liljenquist Family Collection,” a special exhibition showcasing more than 400 Civil War-era ambrotype and tintype photographs. WASHINGTON — A young girl gazes out with a fixed, forlorn expression from inside her gilded oval portal. Attired in a simple stripe-patterned, black gown with mourning sleeves attached at her diminutive shoulders, she cradles a small picture believed to be of her father, a soldier, killed in battle. The moment, captured in a photograph, cannot but tug at the heartstring of any onlooker. But what makes this particular impression exceptionally unique is its enduring emotive power — nearly 150 years after it was created. This touching and rare image is found presently among a splendid array of American Civil War photographs on view here at the Library of Congress through Aug. 13. As Civil War sesquicentennial commemorations shift into high gear, the library has kicked off its remembrance with “The Last Full Measure: Civil War Photographs from the Liljenquist Family Collection,” a special exhibition showcasing more than 400 Civil War-era ambrotype and tintype photographs. The exhibit focuses on soldiers and ordinary people from the North and South who endured the hardships of the four-year conflict. Drawn from some 700 photographs gifted to the Library of Congress by the Liljenquists, of McLean, Va., in 2010, this unique assemblage resulted from a concerted family effort over the past 15 years. Jewelry businessman Tom Liljenquist and his three sons, Jason, 19, Brandon, 17, and Christian, 13, collected the photographs through online purchases and by calling on Civil War-era artifacts dealers in towns and cities primarily in the Mid-Atlantic region. “It’s just been a real labor of love collecting these photographs over the years, making the trips to Gettysburg (Pa.), Fredericksburg (Va.), Sharpsburg (Md.) and numerous other places,” said Tom Liljenquist. Ambrotypes and tintypes are early photography processes developed in the mid-1850s. The ambrotype involved combining an underexposed glass negative against a dark background. The tintype was produced on a thin iron plate coated with photographic emulsion, which, when exposed to light, resulted in a positive image. Ambrotypes and tintypes frequently were presented inside a keepsake case or ornate frame. Both picture-making forms remained popular during the war, but eventually gave way to the roughly baseball card-size, albumen print cartes de visite (CDV). Arrayed over six display cabinets, five representing Union individuals and one chock full of Confederates, the light-sensitive pieces vary in plate size, and sit arranged in tight tile-like ranks. The images possess a striking intimacy that personalizes the conflict. Moreover, many of the pictures may denote the last record of some of the individuals. Part of the viewing enjoyment lies in reading gestures that offer hints about the sitter’s personality. A shot of a seated Confederate, for example, shows him holding a rifle with his arms raised slightly, as if ready for action. Nearby, a possible rebel cavalryman appears more formal and distinguished, with rose tinting on his cheeks and gold accents on his collar and buttons. In another, a cigar protruding from an unidentified Union soldier’s mouth instills the view with a casual cockiness. While many of the photos communicate a confident air, some suggest apprehension. An ambrotype of a wide-eyed young Union soldier clutching his rifle and sword conveys an uneasy feeling, perhaps about what may lie ahead for him on the battlefield. Figures are posed before backdrops appropriate to their military service. One African-American Union soldier, for instance, stands proudly before a painted scene of artillery and a U.S. flag fluttering in the background. Many of the subjects sat for photographers in a studio setting. Other works, such as the tintype of a Union soldier perched on an overlook on Lookout Mountain in Tennessee, and another of Union soldier John E. Cummins standing by a horse, take on a more vivid air with their outdoors locations. Most of the portraits highlight a single sitter. A few feature two or more subjects, including one exceptional gem in the exhibit. 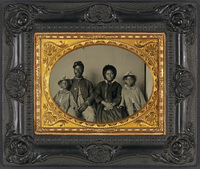 An ambrotype of an African-American Union soldier presents him seated with his wife and two small children. A close inspection of his left lapel reveals a wonderful detail — a small round pin supporting the re-election of President Abraham Lincoln in 1864. The compact nature of the presentation leaves little room for any accompanying text about the subjects. But a user-friendly touch screen interactive directly across from the photographs solves this dilemma. Pick one of the six cabinet displays on view, and you’re on your way. Once a user finds an image of interest, he or she can zoom in and navigate around it for a greater detailed examination. Any available information about the person likewise appears with the selected photograph. 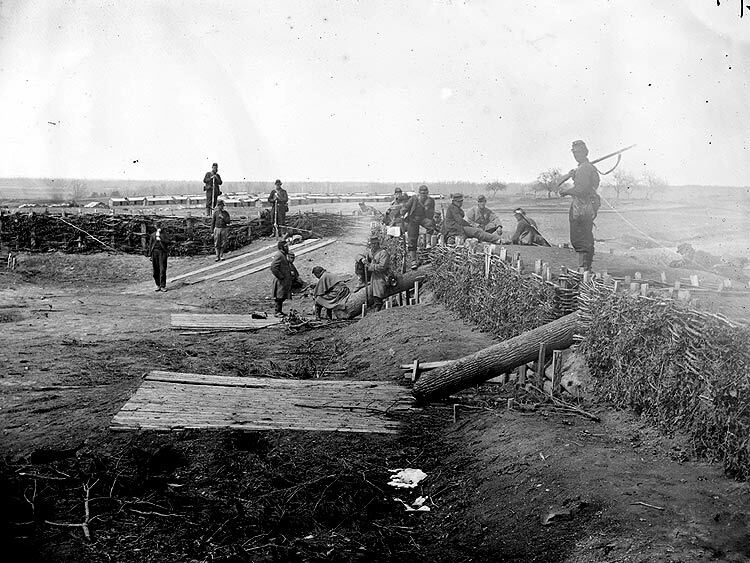 Mike Lynaugh has an interesting collection of Civil War photos that you can view here.